The Soviet Union's forgotten holocaust began in Ukraine with the systematic destruction of Christian landowners called kulaks before the Second World War. During the duration of the Soviet Union's existence, Christians, Muslims, various nationalities and political dissidents we arrested and hauled of to the gulags in Siberia where many would die. 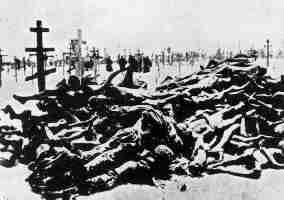 By the Soviet Union's fall, and estimated 100 million Christians perished. We hear so much in high school and College history classes and the Jewish media about the Nazis and the commonly accepted six million figure of Jews supposedly killed. What we don't often hear about are these atrocities. Why? The Jews instigated these genocidal acts, and the Jews today would just assume you didn't know. We, as Christians must make it a point to remember these individuals, for their deaths prove the Jews contempt for Christianity. VICTIMS OF JEWISH/COMMUNIST GENOCIDE, YOU ARE NOT FORGOTTEN!